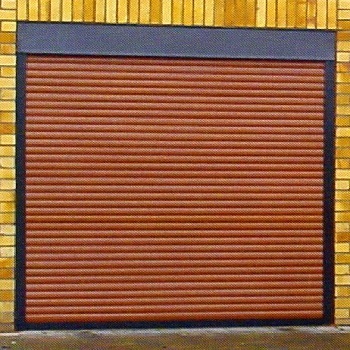 Automated Insulated Roller Shutter Garage Doors by Aluroll at discounted prices. 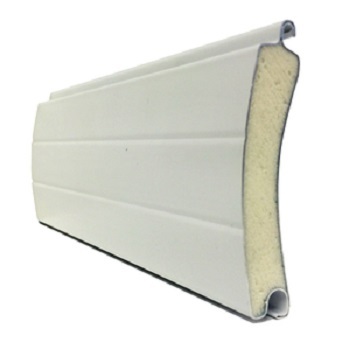 Available as Classic 77mm thick and Compact 55mm thick. Powdercoated in a selection of colours. Motor is fully boxed. Slats made in Germany. All doors made-to-measure at no extra cost. 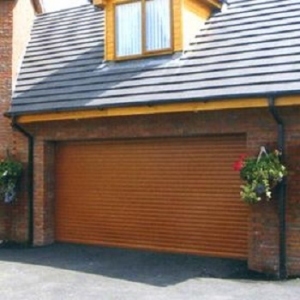 Very high quality version of this popular type of insulated roller garage door. Good level of security. Powdercoated cast aluminium end plates, powdercoated FULL box housing, as standard, and powdercoated heavy duty guides. 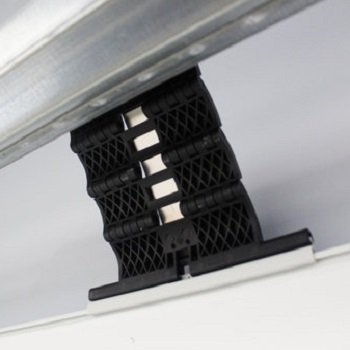 Treble draught seals in the guide channels dramatically reduce draught into the garage. 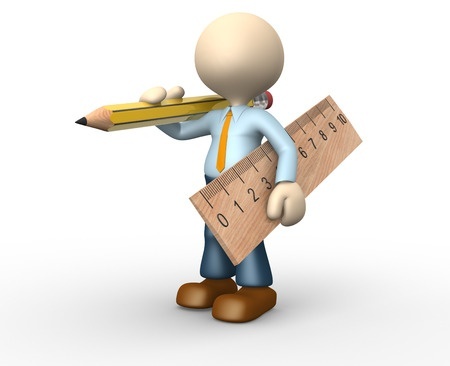 Choice of 70mm or 90mm wide guides at no extra cost. All Aluroll roller doors come with high specification SOMFY control system, auto reverse safety system and two sturdy mini handsets. Numerous colours and woodgrain laminates available. See Aluroll Colour Choice for full range of colours. This made-to-measure roller door is delivered on dedicated factory transport on short lead times, usually 7-10 days. 10 year guarantee on the foam-filled German slat. 5 year guarantee on the NRG motor. 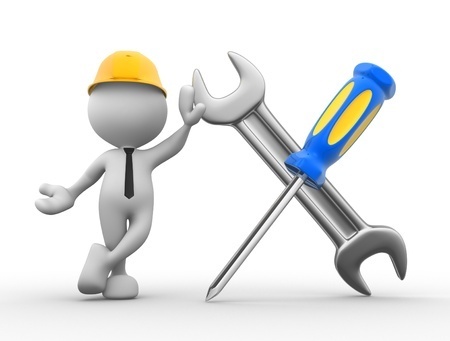 Somfy upgrade at nominal extra cost. Vision slats, glazed or unglazed, available to suit your requirements. Please ring 01691 670394 for details. 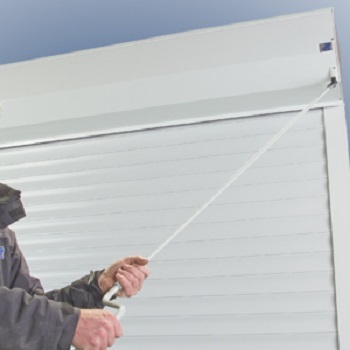 Video explaining features and benefits of an insulated roller garage door. 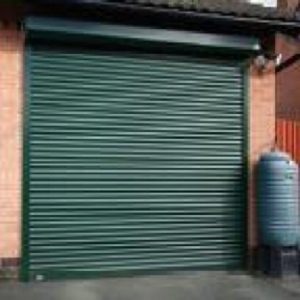 Video guide on how to measure your garage opening for a roller door. 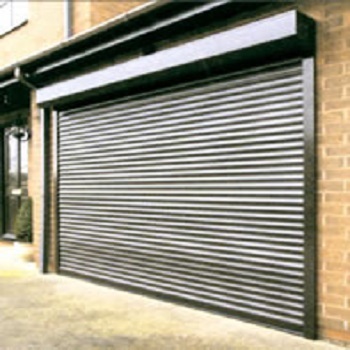 All Aluroll doors have a safety brake fitted. In the unlikely event of the motor drive shearing, the safety brake instantly stops the door from dropping. 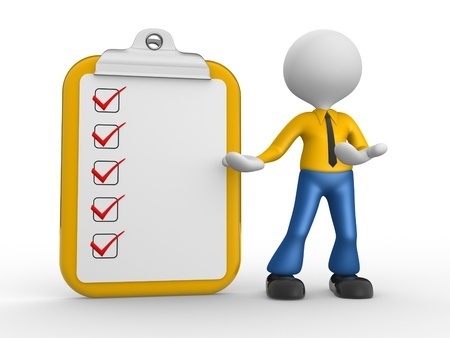 Fully compliant to all the latest CE standards and machinery directives. All Aluroll doors have a bottom edge safety sensor fitted within the bottom rubber of the door. If an obstacle obstructs the door from closing, the soft bottom rubber deforms, sending a signal to the motor to stop and reverse the door. Widths from 900mm upto 5500mm on Classic doors. N.B. Width sizes include the 90mm guide channels each side (70mm guide channels on request). Heights from 900mm to 4000mm on Classic doors. N.B. Height sizes include the 300mm square roller box enclosure (doors over 3000mm high have a 360mm square roller box enclosure). 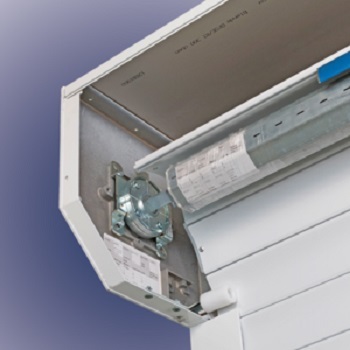 Single phase NRG Eco-nom or Somfy motor with 5 year guarantee is fitted within the shaft around which the curtain rolls up so it is fully hidden. The door can be ordered with the motor fitted left-hand side or right-hand side (looking out of garage). In the event of a power cut, the internal manual override eyelet and cranking handle are used (both included with door at no extra cost). The garage needs an alternative means of pedestrian access in order to access this. 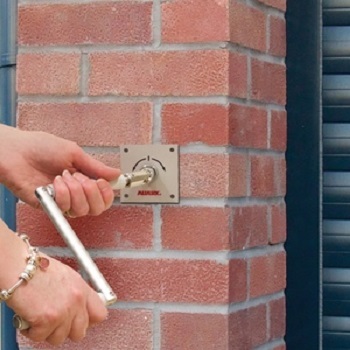 If no other means of pedestrian access is available, a lockable external manual override should be selected when ordering. Bottom rubber & guide channel. This made-to-measure door (at no extra cost) can be installed to the garage opening in a number of different ways. Method 1 is the recommended and most popular method as it looks the neatest and maximises the garage entrance width and height. Installed onto the back of the brickwork. Guides fit behind the brick piers. Box enclosure fits behind the lintel. Maximises entrance width and height. Guides fit between the brick piers with box enclosure fitted under the lintel. Entrance width and height are reduced. Installed in front of the brickwork. Box enclosure fits on the front of brickwork. Garage entrance width, length and height are maximised. The German-made foam-filled aluminium slats are approximately 16mm thick, 77mm deep (Compact slats are approximately 7mm thick, 55mm deep). They have a cfc-free rigid foam core and are fully finished in a wide choice of colours and wood effect laminate finishes, including Golden Oak, Irish Oak, Mahogany and Rosewood. 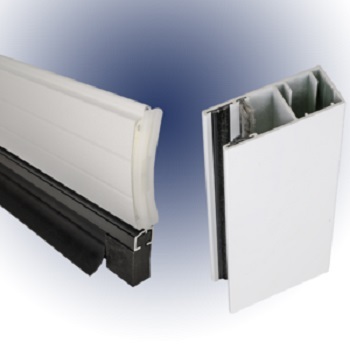 Powder coated guide channels (in matching colour) made from high quality extruded aluminium with built-in multiple draught seals reduces draught ingress into the garage and makes the door quiet in operation. Full box enclosure housing the rolled up curtain, shaft and motor ensures a very neat and clean appearance from inside and outside. It protects the door and safeguards against accidental entrapment. 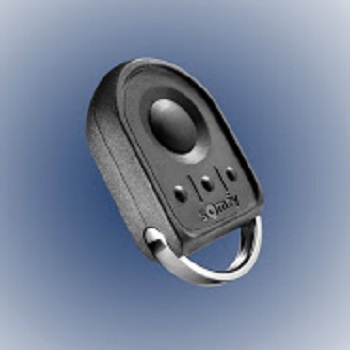 Two tough key-ring type four-channel hand transmitters are supplied with each door. 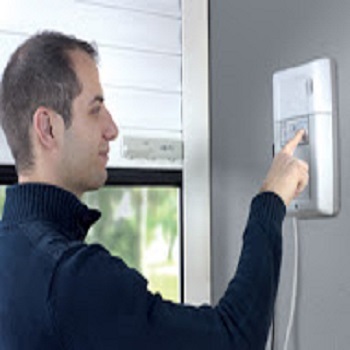 They can operate upto 4 doors independently from the separate buttons on the handset. High quality wall-mounted control panel with clear up and down buttons, inbuilt courtesy light and inbuilt alarm included with each door. The up/down buttons ensure easy activation of the door from inside the garage without a hand transmitter. The light stays on for 5 minutes after the door has been activated and turns off automatically. Rolling code technology on the remote control activation means the handset frequency cannot be cloned, ensuring a very high level of electronic security. Neat and sturdy, cast aluminium end plates (in matching colour) form the flush ends to the roller box. 300mm square on Classic doors up to 3000mm high. 360mm square on doors over this height. 205mm square on the Compact door. Cast pegs on the bottom of the end plate locate into the top of the guides making installation easy. Cast flanges within the box facilitate sturdy and straightforward fixing of the box to the garage opening. Keyring Type Four-channel Hand Transmitter. Aluroll externall low level override. Multiple sprung connectors along the width of the door, connecting the top slat to the shaft, lock into place when the door is fully closed. These resist any upward force, making the door safe and secure. Elite upgrade to Secure By Design level of accreditation available at little extra cost, if required (Guide channel size 150mm). Please send us your sizes and questions using our self survey form. Photos most welcome via e-mail. 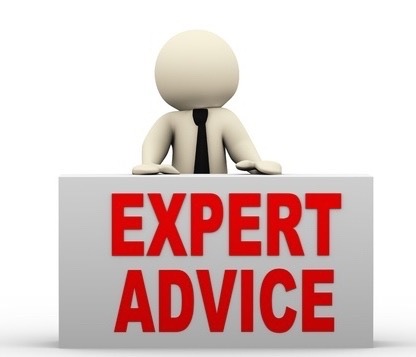 Our technical sales team are always keen to answer any questions over the phone on 01691 670394. Aluroll colour and laminated woodgrain choices.